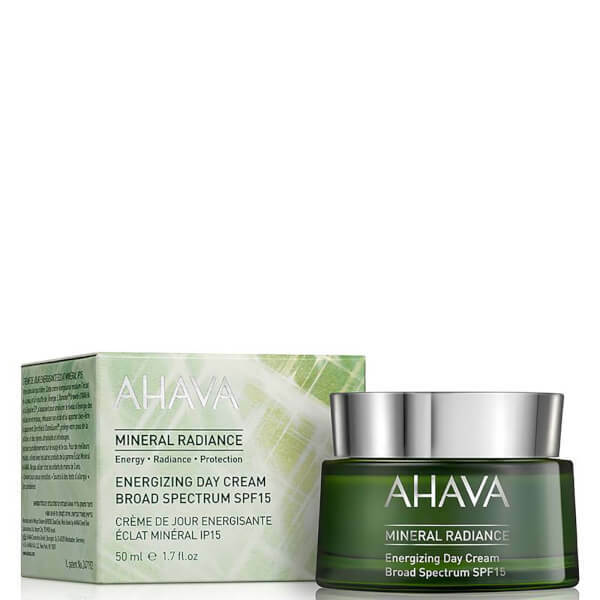 Revitalise dull, tired skin with AHAVA Mineral Radiance Day Cream SPF15; a lightweight, quick-absorbing formula that works to combat lack-lustre complexions. Powered by OsmoGuard™, an exclusive blend of AHAVA’s mineral rich Osmoter™ and Pollustop™, the non-greasy cream delivers long-lasting moisture and hydration, whilst creating a breathable, protective veil that shields skin from UV rays, stress and environmental aggressors. Expect a smooth, fresh complexion with restored luminosity and improved tone. After cleansing, apply a dime-sized amount evenly over face and neck. Aqua (Mineral Spring Water), Homosalate, Butyloctyl Salicylate, Ethylhexyl Salicylate, Polyester-8, Butyl Methoxydibenzoylmethane, Octyldodecyl Neopentanoate, Cetearyl Alcohol, Styrene/Acrylates Copolymer, Biosaccharide Gum-4, Glyceryl Stearate, Caprylyl Glycol, Glycerin, Isodecyl Isononanoate, Methylpropanediol, HDI/Trimethylol Hexyl-lactone Crosspolymer, Silica, Aloe Barbadensis Leaf Juice, Glycol Stearate, Myristyl Myristate, Propanediol (Corn derived Glycol), Sorbitan Tristearate, Trehalose, Peg-40 Stearate, Linum Usitatissimum(Linseed)Seed Extract, Dimethicone, Allantoin, Bisabolol, Ceteareth-20, Olea Europaea (Olive)Fruit Oil, Simmondsia Chinensis (Jojoba) Seed Extract, Propylene Glycol, Benzotriazolyl Dodecyl p-Cresol, Tocopheryl (Vitamin E) Acetate, Dimethiconol, 1,2 Hexanediol, Chamomilla Recutita (Matricaria) Flower Extract, Parfum (Fragrance), Tocopherol (Vitamin E), Lactic Acid, Maris Aqua (Dead Sea Water), Xanthan Gum.